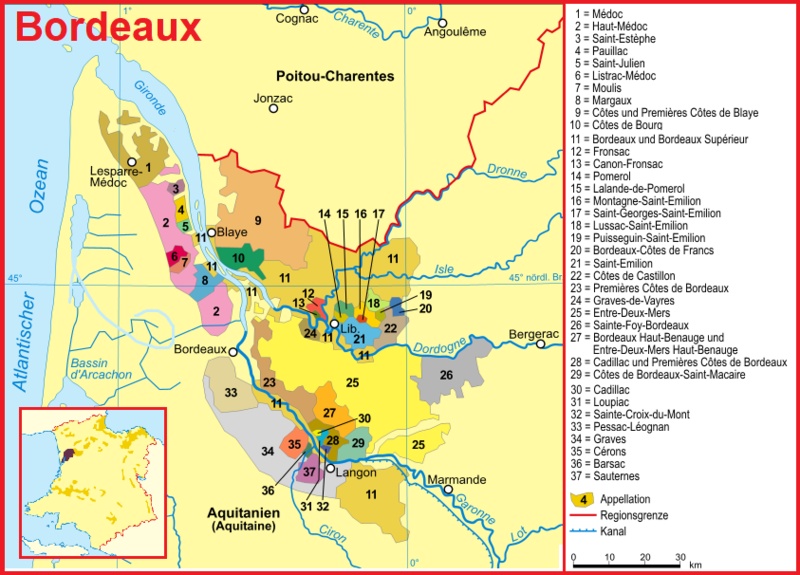 The appellation named after the homonymous community lies to the east of the small town Libourne in the Haut-Médoc on the right bank of the Gironde in the region Bordeaux, The vineyards cover about 800 hectares of vineyards. In the north, the area is crossed by the river Barbanne from the Appellation Lalande de Pomerol demarcated. To the east lies the area Saint-Emilion, The name comes from the Latin "pomarium" (orchard). Already the Romans operated viticulture here. The devastation in the Hundred Years War (1338-1453) between the English and French viticulture was abandoned. At the end of the 15th and in the 16th century vineyards were rebuilt. But late in the 19th century, Pomerol wines became famous. The top rank of the exceptionally velvety, storable red wines, which can be over two years in often 100% new mature, makes the extraordinary soil type out. It is a sand-gravel soil with intermediate layers of clay and a lower layer of iron-containing iron ore stone, which is referred to as "Crasse de fer" (iron slag) or "Machefer". On about 80% of the vineyard is the dominant variety Merlot grown, other varieties are Cabernet Sauvignon. Cabernet Franc and Malbec ( Cot ). These are the typical grape varieties of the Rive droite (right bank). As in the west adjacent Fronsac surprisingly, there are none in Pomerol Grand Cru classification but a group of wineries is recognized as "Premier Crus". The top wine from the legendary Château Pétrus is the best one in terms of quality (and price) Médoc equate. But also some other châteaux fall into this category. Well-known producers are Château Beauregard. Château Bonalgue. Château Bourgneuf-Vayron. Château Clinet. Château Certan de May de Certan. Château de Sales. Château Feytit-Clinet. Château Gazin. Château L'Eglise-Clinet. Château L'Évangile. Château Le Pin. Château La Conseillante. Château Lafleur. Château La Fleur-Gazin. Château La Fleur-Pétrus. Château Lagrange. Château La Grave. Château Latour à Pomerol. Château Petit Village. Château Pétrus. Château Trotanoy and Vieux Château Certan, An important role is played by the famous family Moueix, which owns some wineries here and markets much of the production of Pomerol.